Gamomat’s Book of Romeo & Juliet Slot is a five reels slot with three synbols each and a maximum of ten paylines. Official provider of the video slots were Merkur Gaming and Bally / Wulff. Since 2018, the game is distributed by the actual developer Gamomat in his own name. 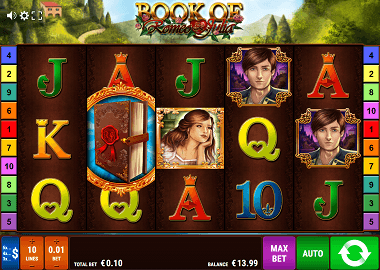 The Book of Romeo & Juliet Slot uses some well-known clichés like the “book”. We already know this famous symbol from “Book of Dead” by Playn’Go or the “Book of Ra” by Novomatic. Also in the Romeo & Juliet Slot this symbol is the most important symbol of the game! Symbols and payouts: The symbols on the Book of Romeo & Juliet Slot are quickly explained – the game is very simple and also suitable for newbies. There are only 9 different symbols, of which the low-paying symbols are 10, J, Q, K and Ace. The letter symbol and the dagger symbol pay 750x for a combination of 5 symbols. The Romeo symbol is the second best – here you win 2000x your bet with a 5 combo. The most valuable symbol is Juliet – 5000x your bet you win with a complete payline! Wild and Scatter: Like some EGT, Novomatic and Playn’Go slots, the Book of Romeo & Juliet slot has only one Wild and Scatter symbol: the book. It is also the only symbol where you get payouts, even if the book does not land on a payline. For three books you get 20x, for 4 books 200x and for 5 books even 2000x your bet. In addition, free spins are triggered. Free Spins Feature: As already described, the book symbol appears on many famous video slots. Also at the Book of Romeo & Juliet slot is the highlight when you trigger free spins. First and before the free spins starts you will receive a random bonus symbol. This guarantees you additional winnings in the free spins feature. If your bonus symbol lands on a reel, the entire reel becomes “wild”. You can also make very good profits with small bets. With three more book icons you can also extend the feature by 10 more free spins. As we mentioned earlier, Gamomat sells its video slots to the online casino under its own label. Thus, you probably already know many slots which were originally offered by Merkur and Bally/Wulff. Play the Book of Romeo & Juliet by clicking on the banner above. Here, you can find more Gamomat games for free. If you want to play with real money as well, the LVbet Casino and the Energy Casino are a good choice. In both casinos you can play a free bonus after registration.